Thirteen graduates drawn from various universities in the country have started benefiting from a training programme worth over $650,000 financed by manufacturing and electronics giant, Siemens. The programme which is aimed at building the capacity of the graduates forms part of its contribution to the local content agenda being rolled out by the country in the oil and gas sector. 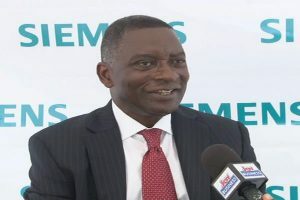 In an interview with JOY BUSINESS at the launch of the programme in Accra Tuesday, the Chief Executive Officer, Edmund Acheampong said the eight-month training would enable the participants easily take up jobs in the oil and gas sector. “Those we have put to training are the creme of the crop as far as we are concerned. We are confident that after the training they would go out there and apply their knowledge and perform proficiently” he said. He said they would hire three of the graduates through their partner and the other 10 would be fully prepared to be employed by any operator in the oil and gas sector. “We would be the first to recommend each of these graduates to any interested organisation,” Mr Acheampong said. Siemens provided 7000 hours in training the graduates.